While getting my degree in Theatre from Southern Illinois University, I learned to appreciate the works of Shakespeare. The first thing I learned is that the plays are meant to be performed not just read. Once I started performing scenes from Shakespeare’s collection I saw how much fun and in depth the stories were. Yes, even the tragedies were fun, from a performance perspective. So now when I hear of students having to read Shakespeare I cringe a little knowing they may never learn to appreciate Shakespeare. In comes L.A. Theatre Works and their releasing in audiobook format theatrical performances. I’ve had the chance to listen to several of these and, to be honest, I was leery at first. I was thinking, how can you turn such a visually dependent medium into an adequate audio book? L.A. Theatre Works goes well beyond the adequate, and are able to produce superb audio versions of some great performances. Most of this lies in the excellent production using sound effects that make sense in the right places and with even more excellent casting. The many plays always feature accomplished actors, not just famous ones but ones that are capable of filling the role to perfection. 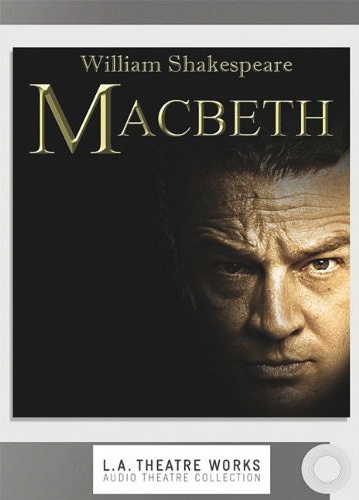 In the case of this release, James Marsters is cast in the lead as Macbeth, and just knocks it out of the park. There is one scene where the ghost of Banquo sits in Macbeths chair at a dinner party and the issue is that Macbeth begins yelling at the spirit and the other members of the party don’t see the ghost. In his vocal gymnastics alone on this recording, Marsters is able to explain to the listener that only he sees the ghost. Great performance throughout by all the actors. As for the story of “Macbeth,” this is one of Shakespeare’s shortest plays and carries with it some baggage. “Macbeth” is considered a cursed play, so much so that theatre tradition does not allow one to mention the name of the play within a theatre, many refer to it as “The Scottish Play” and when referring to the main characters, just call them “Mr. and Mrs. M.” The reason behind this superstition goes back many years, the origin is that Shakespeare used some actual witches’ spells when writing it, and as revenge for giving out the secrets of the craft some real witches cursed every mention of the play. The play is about a General in the Scottish army who becomes king, but not in a traditional happy sort of way. Two generals, Macbeth and Banquo are returning from a battle and stumble across three witches in the forest where the tell the two of their fortunes. Macbeth will be king and Banquo will have his children for many ages become King. Putting the thought of becoming King into Macbeth’s head leads to the murder of King Duncan and the fall into madness that surrounds Macbeth. Soon he must go to the witches again to find out more of his future. This time around the witches tell him that no man born of a woman can kill him, leaving Macbeth with the false belief that he is invincible. Tragedy ensues and another classic has been engulfed. Enjoy this classic performed by wonderful cast.